I grew up in a household where “animals” belonged outside or in the barn. Cats were tolerated because they caught mice and were independent (but in the barn). No dogs…as they served no commercial purpose…consumed cash…chased farm animals…and defecated on the lawn. My wife, on the other hand, grew up with dogs (in the house), loved dogs and missed dogs terribly. I stoutly held my ground for 20 years. Kanigans don’t have dogs in the house or have dogs at all. Yet, I continued to be worked over at home and by a friend of mine at work (CP you know who you are). 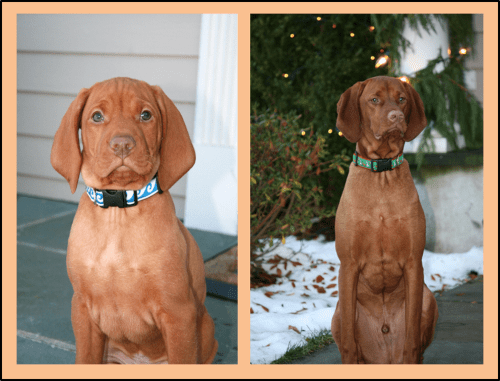 Zeke, a Hungarian Vizsla arrived at the Kanigan household on February 16th, 2008. Vizslas were originally bred as bird hunting dogs for Royalty. We don’t hunt. We don’t bird watch. And we certainly don’t live in a Kingdom. Vizslas are “velcro” dogs. He will follow you everywhere. He’s restless unless you are resting. Vizslas need exercise. He is walked 1.5 to 2 hours a day. The kids walk him an average of 0 to 3 minutes per day and that average is moving to zero minutes each day. (So much for the kid’s part of the agreement). If you don’t plan to exercise your Vizsla be sure that you have enough “leash-free” area where your dog can run and play – – or you will have a real problem on your hands. I tell everyone who is thinking about a Vizsla, think VERY hard about the responsibility with this breed. Big time commitment. Vizslas are loyal, gentle and VERY sensitive. They cower when you yell or raise your voice at them. When I yell or play-fight with the kids, Zeke attacks only me…I guess he feels that I am the threatening Dominant King in the Household. Zeke has inherited traits from his Dad. When he’s tired and cranky, you’ll know it. Vizslas are like self-cleaning ovens. He is CLEAN and without much maintenance from us. Vizslas can tell time. He knows precisely when it is meal time. Meal time is a chewy at 6am. Dog food at 6:10. Peanut butter in a Plastic Kong toy at high noon. Dog food at 5pm. Almonds with Dad just before bed time. (And somehow he is not overweight. Can’t say the same for me). Most Vizslas sleep on the bed. No, let me clarify with some precision. They sleep under the covers. This would include Zeke. Summer time, no problem. Winter time when the house is colder – it becomes a restless night for all. When he stands up 4x to 5x a night to rotate to get comfortable – cold air rushes in – and then he collapses to fall asleep again. You get the picture. Zeke is rested and ready to go in the morning. Dad rolls out of bed a Zombie. Zeke generally doesn’t like to be pet…and certainly not on the head. Yet, he loves (LOVES) his ear rubs and his neck rubs. Vizslas welcome you by wiggling their entire body and going in and out of your legs. Unconditional love wiggles. I look forward to the welcome home from work each day. So, what’s the epilogue for the man with the long-standing “No Dogs Here” position? As the Vizsla dog website states, Vizslas are in it 100% and they deserve nothing less from you. I love this tale! Our Jack Russell Terrorist is the same way and whines if someone is in his spot on the bed. Zeke is a gorgeous dog! So glad you fell in love with him! I remember having a conversation with Susan when I was passing through Chicago while at The Academy. I told her the thing I missed most when away at school was having a dog. She told me she also missed the company of a dog, but that you weren’t in favor of it. I never thought you’d get one, let alone let him in the bed! You’re whipped! We don’t even let the dogs in bed. Good to know you discovered the unconditional love of a dog. Funny, you are so right! Great before and after pictures. Zeke sure is a great poser!! a great story by a great story teller! Dave, I think what this tells me is that there might be room in your house for a Vizla sister for Zeke some day…. Have you started peeking at the Vizla rescue sites? Having a dog in the family (trust me) is the same as having cats in the family, just more kids to love.. glad to hear how much joy he brings you! I grew up as a dog person. For the last 4½ years I’ve been an indoor cat person. Maybe I just love Mother and Father Nature. Zeke is a beautiful dog and sounds like an amazing character. Great story – My Jack Russell and I can relate! I love this blog and I have no problem with animal lovers. I still couldn’t do a dog in the house though. I’m too much of a neat-freak and even a little hair would drive my OCD crazy! Enjoyed the post though. What a handsome dog ! I read somewhere- “You haven’t loved with your whole heart, if you haven’t loved a dog” ! Kudos to you for becoming a dog convert 🙂 Zeke sounds wonderful and thanks for sharing this with the world. A year ago, a 1-year old German Shorthaired Pointer adopted me. Everything you’ve written about your Vizsla is true for my GSP. In fact, I think the German Shorthaired Pointer has Vizsla in him as the breed is a conglomeration of several other hunters. Active? I did not know the true meaning of the word until Jasper moved in with me. I like your post and love your bulleted descriptions. I love how your dog sleeps under the covers! I’ve always wanted a Vizsla. But after reading all of that, I think an Akbash is more appropriate. I like sleep too much. Great post! Glad to hear you are all in! From the eyes in the picture – how could you not! Animals, they get you in the end! I have worked with hunting dogs, and farming dogs that will herd the sheep. Dogs are good at protecting property and family, they will alert you to intruders, and will tell the intruder to stay away. Dogs are good security systems overall. Dogs help the blind; they can find drugs and bombs; they can sense cancer; they can help children to read; they help autistics and the ill to recover and be calmer, they help viloent prisoners to find their humanity. They are also loyal loving friends. Interesting. Hi Alex. It took me a long time to figure this out. I’m now there. Thanks for stopping by. The journey of man evolution. : ) By dog. For a faithful companion, who cannot love a dog. Beautiful coat. Thank you Perpetua. And I agree. Great post! We have Vizsla pup that will be a year this month. I was searching for articles on how to sleep with a restless dog and this post came up. I gave in to crate training and my wife has not let me live this down to this day. Our Vizsla tosses and turns all night and it is not uncommon to wake up with a foot in your face or to be stepped on as she turns around and throws her 50lb body down. I was looking for some relief, but it seems like this is the norm. Thanks for sharing! Mark, we are 6 years in. There is NO relief. 🙂 But we love him anyway…Vizsla’s are something special. Good luck with your pup. And thanks for stopping by. Where to start? Our (my wife’s and my) first dog, 1981, a vizsla because our neighbors had one. In my early 30’s, I started running because Kate clearly needed the excercise. The running changed my life. She lived to almost fifteen, she was difficult because she was timid, so my job was to keep her out of trouble. Next dog: a vizsla + black lab mix. He was a lightly built black lab with a lot of stamina and a REALLY good sense of humor, no timidity here. Then a Weimareiner from a friend. Then a German Shorthaired Pointer from the shelter, then another one. Now we’re down to just one GSP. The continental pointers are simply magnificent companion animals. Smart, loving, good with kids, and there are no better friends. And yes, they are not for you if someone can’t be with them for most of the day. They have energy and intelligence; that’s a big problem if you can’t be there to amuse and occupy them. And yes, they do love to sleep with you. Reading your comment, I could not but smile throughout. Thank you for sharing. I’m up at 3:30 because our Zeke is like a leaning toaster oven.